Public Opinion On Gene Editing Varies Depending On Knowledge, Religion : Shots - Health News Scientists are getting closer to being able to alter people's genes permanently. A survey found that people are more cautious about changes that could be passed on to future generations. People generally think that editing human genes might be OK, but most think that there's a clear line that shouldn't be crossed when it comes to changing traits that would be passed down to new generations, according to a survey reported Thursday. It's not an abstract question. Earlier this month, gene editing made headlines after scientists in Oregon reported they had successfully corrected a genetic defect in human embryos in the laboratory. Along with the potential to prevent some diseases, this technology also comes with complicated ethical questions, including what kind of gene edits would be acceptable and who could benefit or be harmed. Just 26 percent of people surveyed approved of making changes to genes that will be passed down to future generations for enhancing normal traits — edits that would change a person's eye color, for example, or their height or IQ. People were more accepting of gene editing aimed at treating or preventing disease. In these situations, about two thirds of people saw both inheritable treatments and those that can't be passed down as "acceptable." Another report, published this week by the Pew Research Center, also showed that people are more concerned about germline editing, which changes can be passed down, than they are about gene editing done in somatic cells, which can't be inherited by future children. Parents of minor children were more concerned. "There's probably much more optimism rather than pessimism about this technology overall," says Dietram Scheufele. He's a professor of science communication at the University of Wisconsin-Madison who led the survey published Thursday in Science. "In spite of that optimism, though, there's also a really strong desire across different groups for broader public debates that involve different viewpoints and help us sort through some of the societal questions, the ethical questions, the political questions that this technology without a doubt raises, he says. Scheufele and colleagues analyzed survey responses from 1,600 people in December and January to questions such as "How likely do you think it is that human gene editing will give some people too much power to change the course of human development?" The survey also asked about different applications of gene editing that could be possible in the near future, including "How acceptable do you think it is to use gene editing to treat a person's physical diseases or conditions, such as cancer, if those changes will not be passed on to future generations?" Robert Blendon, a professor of health policy and political analysis at Harvard's School of Public Health, offers a caveat to the data: Most adults in the U.S. aren't gene editing experts. "Very specific conclusions have to be tempered by the fact that the people being surveyed are not as aware of the issue or the science behind it," Blendon says. He's seen from his past work, including an analysis of 17 gene-editing polls from the past three decades — that small changes in wording can cause respondents to change their answer to a question, even when the facts haven't changed. "When you use the term 'embryos', you get a somewhat less supportive view," he says. "So if you don't mention embryos or anything like that, you get much higher views for you know, getting rid of things like Huntington's disease." Scheufele responds that polls commonly ask people questions on topics they're not necessarily familiar with. "We want to know where people are at right now," he says. In Scheufele's analysis, one fourth of people didn't answer any of the questions correctly, and more than one third answered most of the questions correctly. Knowing more about gene editing was associated with more support for it, according to the study. Religion also seems to play a role in people's opinions of gene editing. This survey found that 50 percent of highly religious people expressed support of gene editing for treatment purposes, while 75 percent of those with "low religious guidance" say they support these applications. An earlier Pew report also surveyed people on religion and gene editing, finding that most highly religious Americans would not want gene editing that gives their baby a "much reduced risk of serious disease." (The wording on the questions differed between the Pew survey and Scheufele's survey). 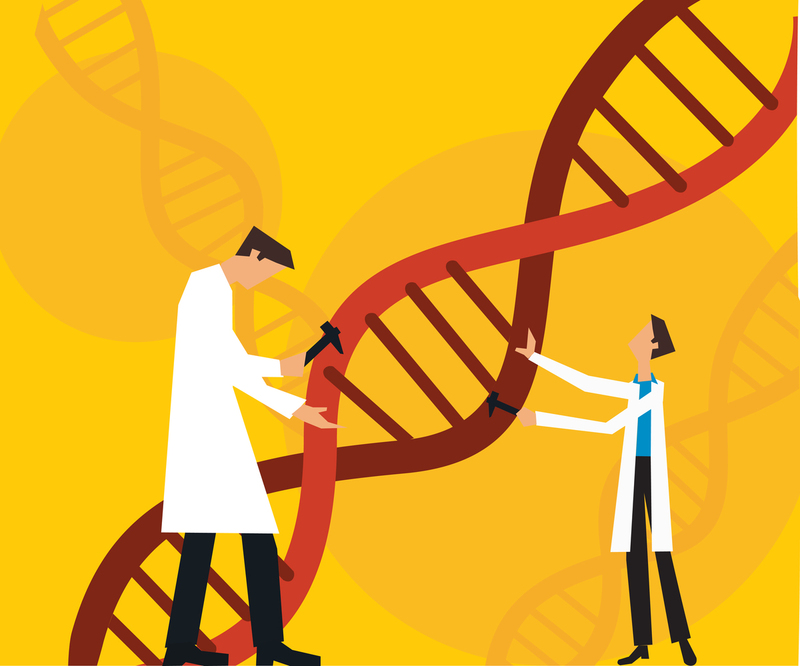 Although Scheufele says there was a "relatively broad consensus" across groups that the scientific community should consult the public on the topic of gene editing, putting that into practice may be difficult. "I think that's in many ways the million-dollar question," he says.